Portal 2 is the sequel to Valve’s hugely successful Portal. Portal 2 is a first person puzzle platform game in which the player uses portals to move itself or objects from one area to the other. 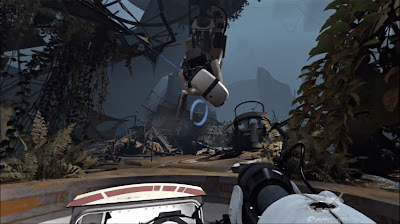 Most of what made the original game has been retained and a couple of new features have been added but can Portal 2 outdo its predecessor or will it have hit a wall it cannot overcome. You are once again in control of Chell, a test subject at Aperture Science. 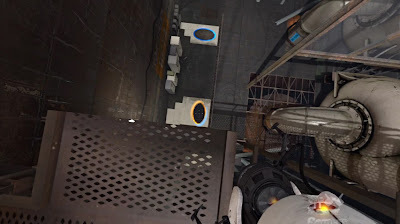 After defeating Glados in the previous Portal, Chell has been placed in a sleep like state for many years as the facility has been breaking down and losing power. This leads you to Wheatley, a small round robot that’s supposed to be in charge of the actual test subjects but explains to Chell after she has awoken, that she is the last functional one. As Chell and Wheatley try to escape from the facility, they accidentally revive Glados. Glados has not forgiven Chell for murdering her all those years ago and decides to rebuild the facility and put Chell through more tests. This inevitably leads to Wheatley taking over, Chell being betrayed and both Glados and Chell, exploring the decommissioned area of the facility and hearing from Aperture Science CEO Cave Johnson. The game’s story has a good sense of character progression and with the addition of Wheatley and Aperture Science CEO Cave Johnson; it really adds more depth to the storyline. Also the game features early levels from the previous Portal that have aged and broken down. This a nice touch since it works with the plot of the story but also previous Portal players can familiarise themselves with it and it adds a sense of nostalgia. The core element of Portal 2’s mechanics is the ability to create portals and freely pass between them. 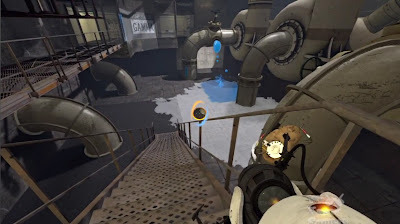 These portals are mainly used in the test rooms that take up the majority of the game but are also used in some of the areas outside the main facility. At the beginning, you are only able to create an entrance portal with the exit already made but as you progress and upgrade the Portal gun, you will be able to control both the exit and entrance portals as you see fit. Are you sure you want to take the jump? As the test chambers become more difficult, other objects are introduced such as the jump pad to reach higher heights, bridges made of light to create new pathway and Mirror cubes to redirect the lasers to wherever you want. The most unique new addition to the game would have to be the different types of Gel in the old facility. These Gels come in 3 different colours and are used for different purposes. The Orange Gel is used to give you a quicker run; this is especially useful for when jumping over large gaps. The Blue Gel is used to give you extra height in your jumps also if you land on the Blue Gel from a good height; you’ll be able to jump incredibly high. The White Gel is used to make portals on. This comes in really handy when you really need a portal but the surface you’re currently standing on won’t allow you to create one. This place did need some colour! Portal 2 makes use of simple assets to create fun and engaging puzzle mechanics. I find it good that it starts off easy to get anyone who hasn’t played the previous game up to speed rather quickly. The new additions such as the Gel and bridges make for some more interesting puzzles and to see how these small elements were put together in such a way that made the game’s levels worthy to be solved. One of the newest features for the Portal series is the ability to play Co-op with a friend online or locally. Two new robot characters are called P body and Atlas are introduced and this mode has a similar set up to the actual Campaign except here you must work together with your partner to solve puzzles, unique to the Co-op mode. A couple new features have been implemented such as the ability to mark where you want your partner to go and the more comedic gesture feature where you can wave to each other and play Rock, Paper and Scissors. Co-op with a friend is a great addition to the game as the puzzles are well adapted to make sure both persons are fully involved in order for it to be completed. Other than that it’s not much different to the actual Campaign; however what really impressed me was the fact that it could be played in a split screen format which is something that is heavily missing from modern day games. 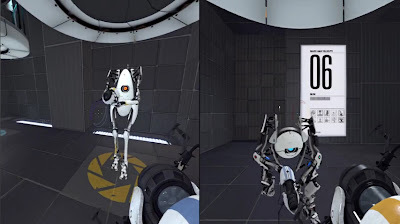 Portal 2 uses the same kind of graphics seen in its predecessor, a simple yet bold look that makes up the majority of the Aperture Science Laboratories. The games uses strong textures that really stand out and since the laboratory has been breaking down, it gives off a more dirty and grungy visual to compliment the story. 3D models are simplistic and are usually in the form of blocks since the test chambers are designed like that however once you get down to the old facility, the environment does begin to take a more detailed shape. The game’s lighting is one of its strongest visual aspects. 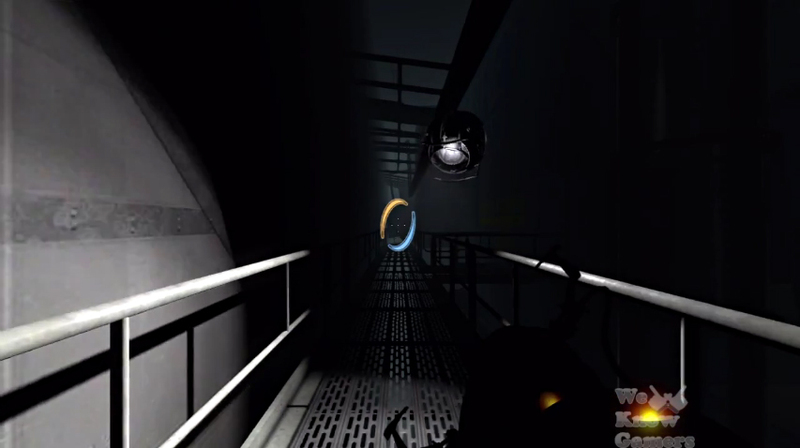 One instance the lighting in the game is shown off is when Glados decides to turn off the lights in the facility; this in turn causes Wheatley to act as a light source to guide you through the darkness to safety. If anyone was afraid that Portal 2 couldn’t beat its predecessor, it certainly does. The addition of Wheatley and the Aperture Science CEO Cave Johnson has added more depth to the overall storyline and there seems to be a good sense of character progression as you play through the game. Graphics are simple and could use more detail however in doing this, the gameplay is smooth, there are no weird drops in the frame rate and the textures come out really strong. Interesting and fun puzzle mechanics gives Portal 2 the one over on its predecessor.